In the late 19th century, Americans with a taste for adventure headed west on the nation’s railroads. Along the way, they stopped to eat and rest at the hotels and restaurants of America’s legendary innkeeper, Fred Harvey. Harvey liked to put his properties right next to the railroad tracks. But in 1881 he switched gears, erecting a lavish resort on the edge of the Northern New Mexico wilderness. A marketing maven of his day, he arranged to have the area renamed “Montezuma.” Then he got the Atchison, Topeka and Santa Fe Railway to build a rail spur linking the resort with nearby Las Vegas, NM. If you were a tourist, you came to the castle for a taste of the Wild West. If you had tuberculosis, you came for the climate. The hotel burned down in 1884. Harvey, undeterred, teamed up with the AT&SF Railroad to build an even grander place just up the hill. Made of stone, this “absolutely fireproof” structure caught fire four months later. The blaze left two floors more or less intact, so the castle on the hill rose to life a third time in 1886. The rebuilt, Queen Anne-style resort offered 400 rooms, captivating views, a self-supporting spiral staircase and a “males-only” reading room. Rounding out the amenities were a stunning dining hall, rare flowers, fountains, and grounds for tennis, archery and croquet. There was even an exotic-animal zoo. The castle’s popularity began to fade around the turn of the century, when a new rail line blazed an easier route to the Grand Canyon. In its lifetime the hotel hosted to everyone from Jesse James and Teddy Roosevelt to Emperor Hirohito and Ulysses S. Grant—even Billy the Kid! But even in its best days, the Montezuma had never turned a profit. The YMCA bought the place for $1, then sold it to the Baptist Convention, which turned it into a college. The Jesuits bought the building next and used it as a seminary. Dana B. Chase. 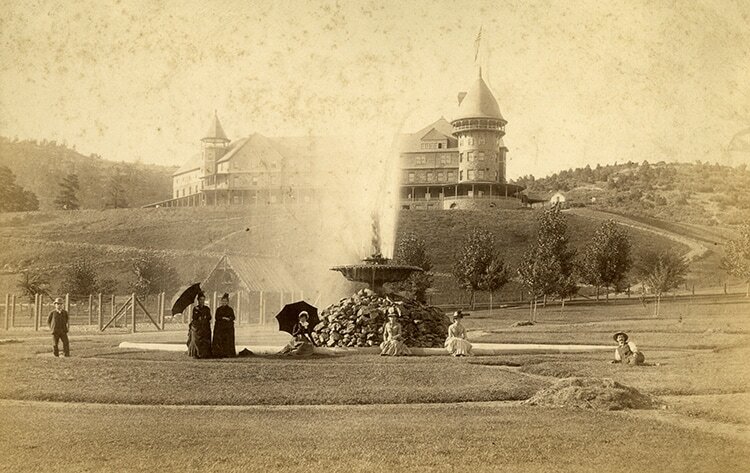 Montezuma Hotel, Las Vegas Hot Springs, New Mexico, 1888? Courtesy of the Palace of the Governors Photo Archives (NMHM/DCA), Negative Number 056980. 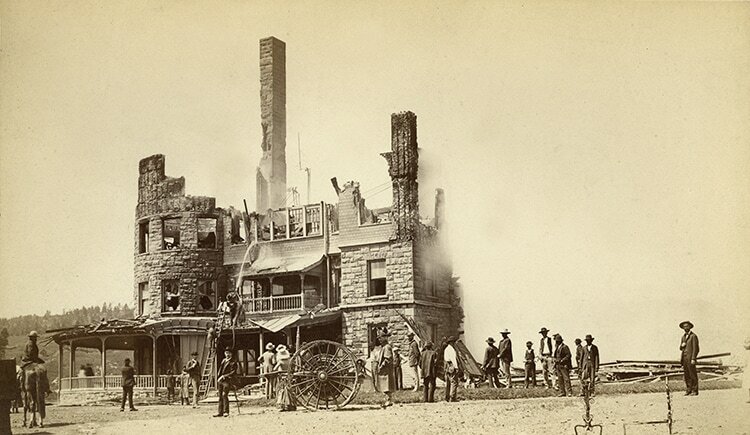 Montezuma Hotel after the August 8, 1885 Fire, Las Vegas Hot Springs, New Mexico,1885. Courtesy of the Palace of the Governors Photo Archives (NMHM/DCA), Negative Number 121216. Courtesy of David M. Beach, ​dbeach7@cfl.rr.com. After that, the once-grand castle sat empty for nearly a decade. In 1981 it was purchased by Armand Hammer, a wealthy businessman and philanthropist. He gifted the castle plus 100 acres to United World College, a pre-university institution with branches in numerous countries. The college built dorms and other facilities but could make only partial use of the castle, portions of which had been declared unsound. In 1987, the once-lavish structure was condemned. But it rose to life yet again in 2001, when a generous contributor funded a $10.5 million restoration. Today’s Montezuma is as grand and gorgeous as the one that welcomed adventure-seekers from a different age. Find out about our own history: learn how the first August Camp came to be—right here at the Montezuma Castle!